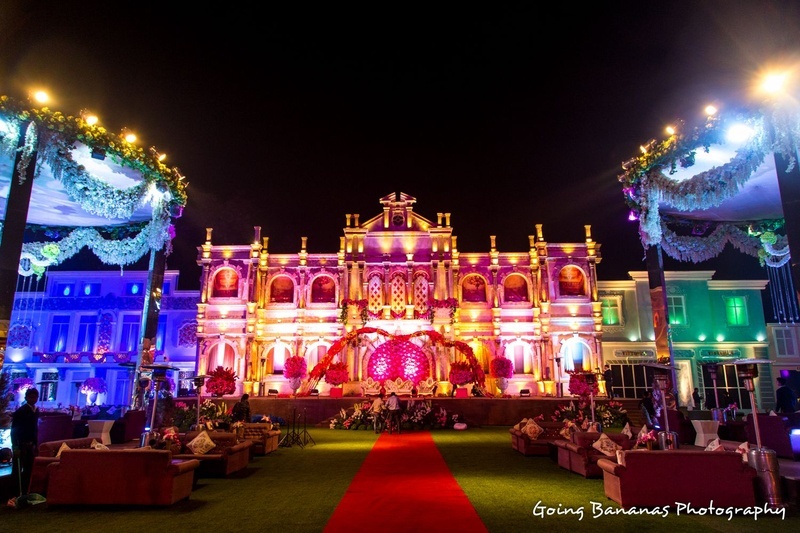 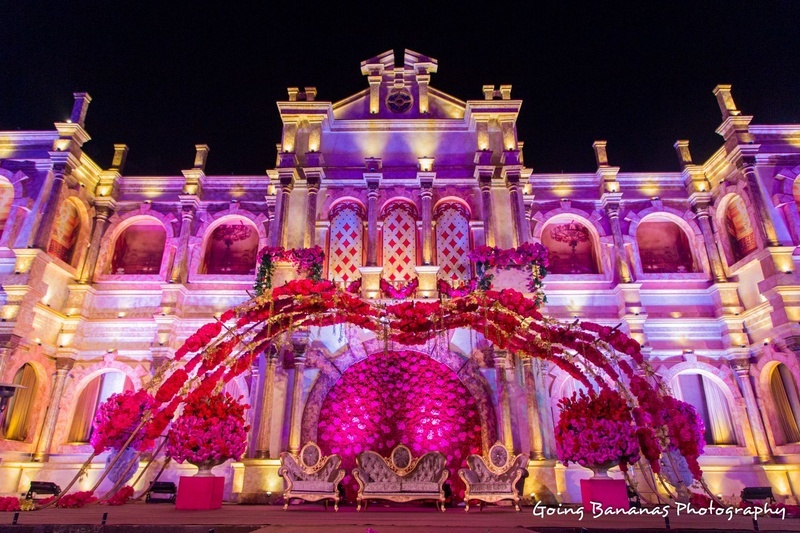 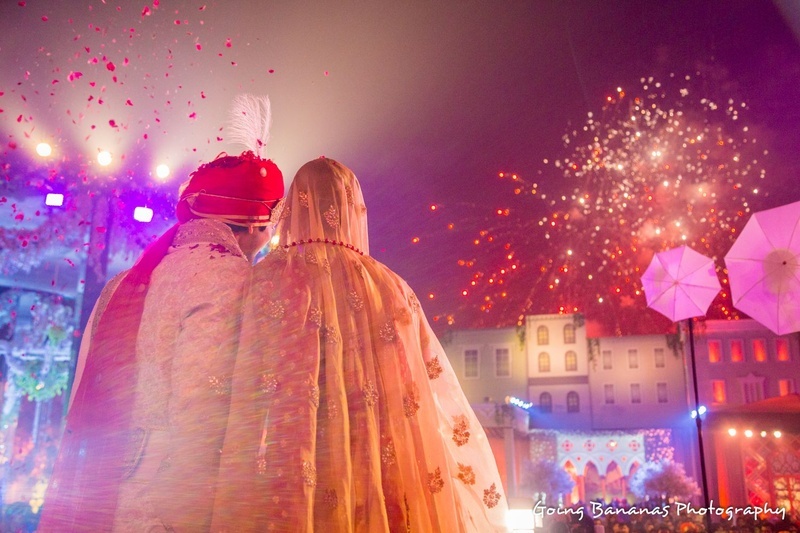 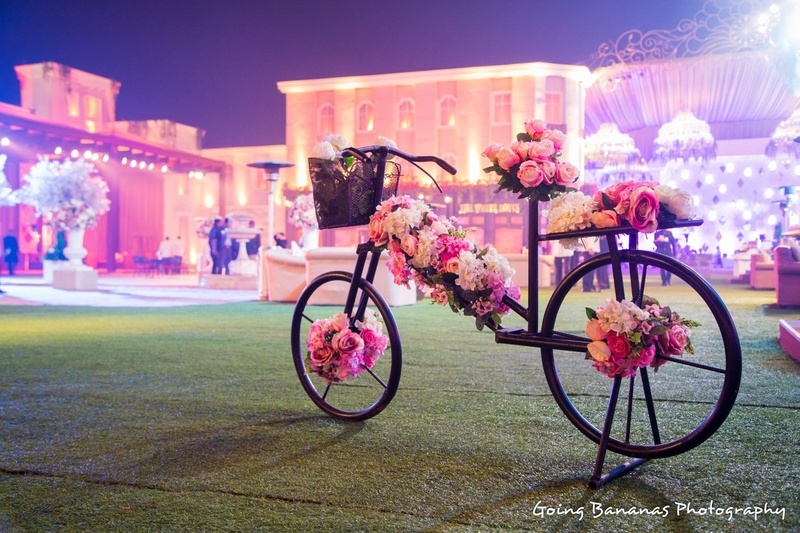 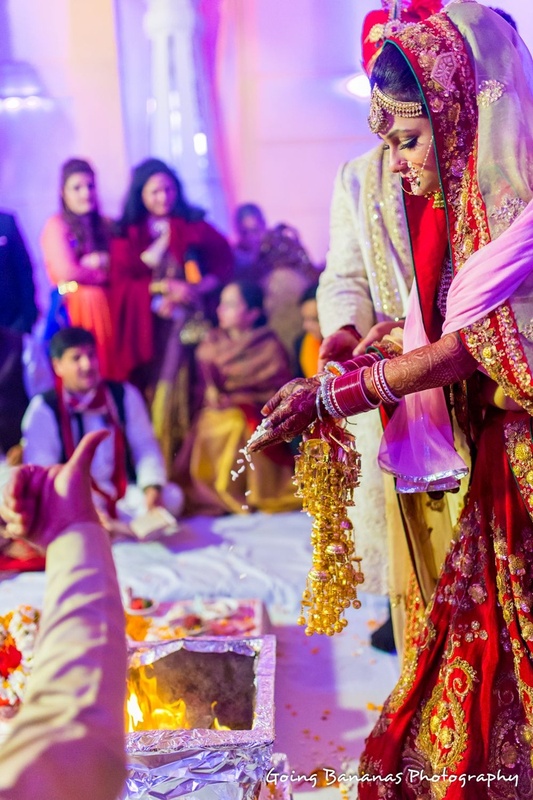 If two things can make your wedding an extravagant affair, it definitely is the lighting and décor; and this wedding affair is proof of just that! 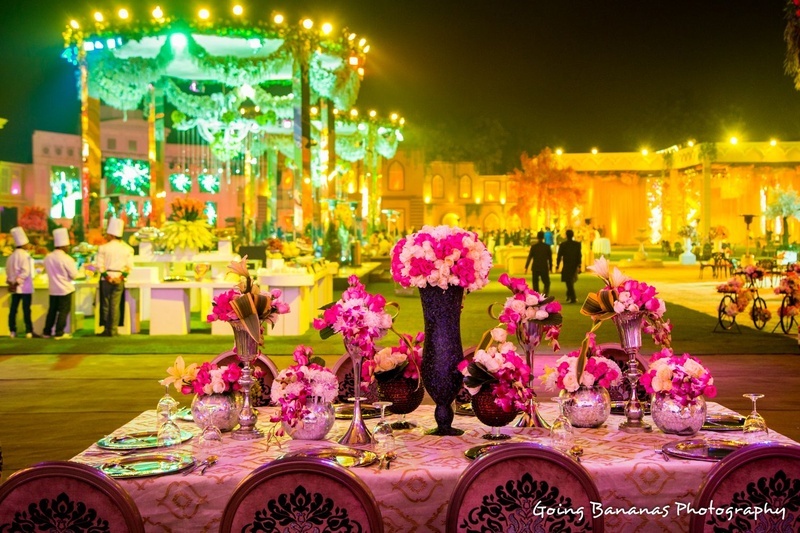 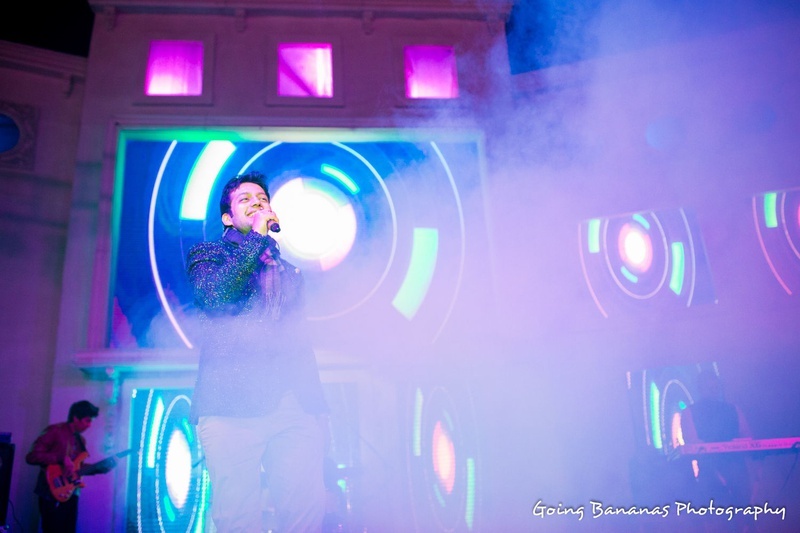 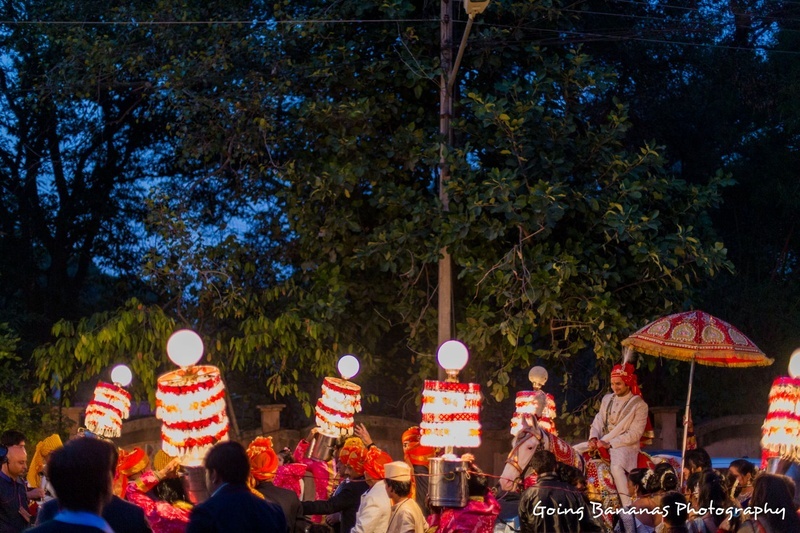 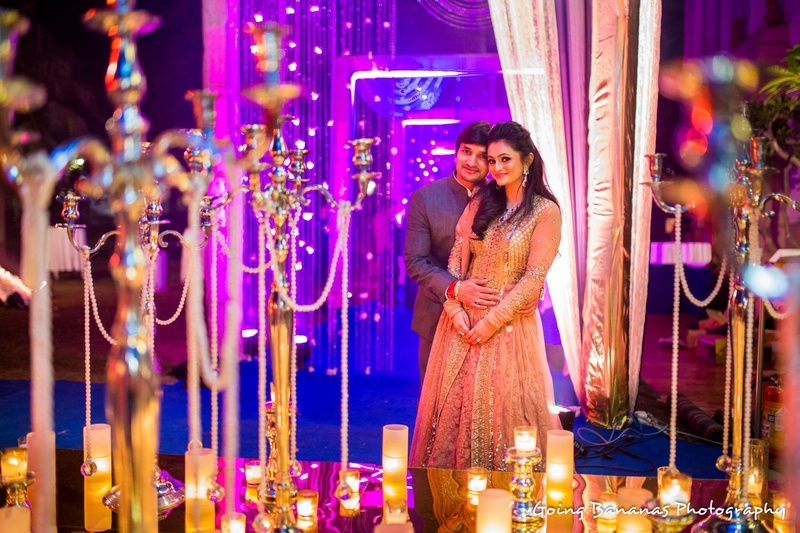 Celebrations began with the resplendent sangeet ceremony with décor that had our jaws dropped to the floor. 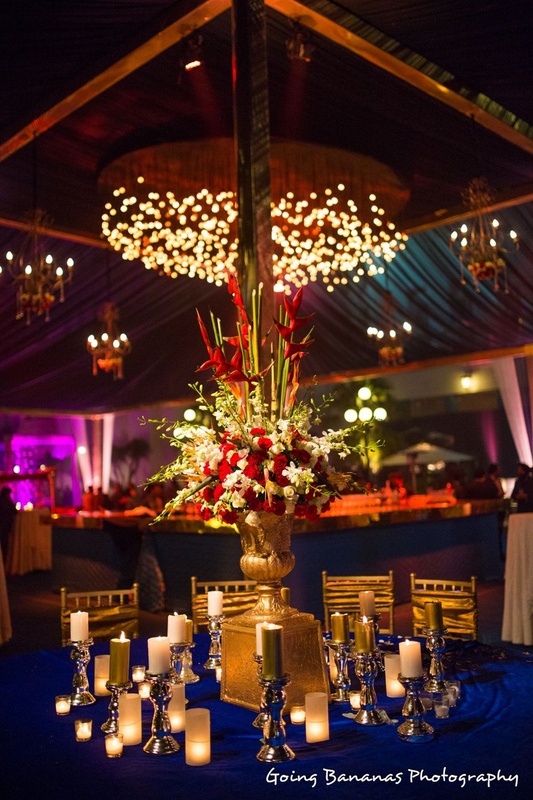 The bright blue focus lights, regal floral centerpieces, yellow string lights and beautifully-lit, wrought iron chandeliers created just the right ambiance for a grand yet fun sangeet ceremony. 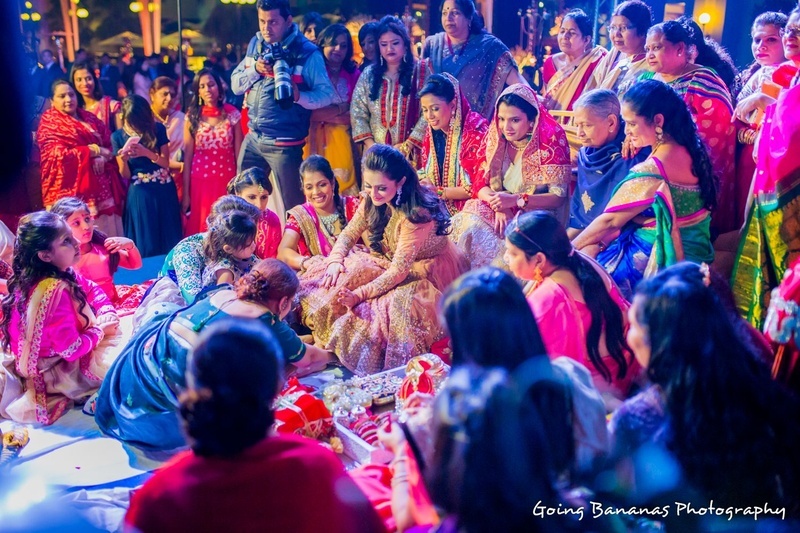 Festivities continued on to the glorious wedding ceremony that was filled with bucket loads of beauty in hues of pink and gold. 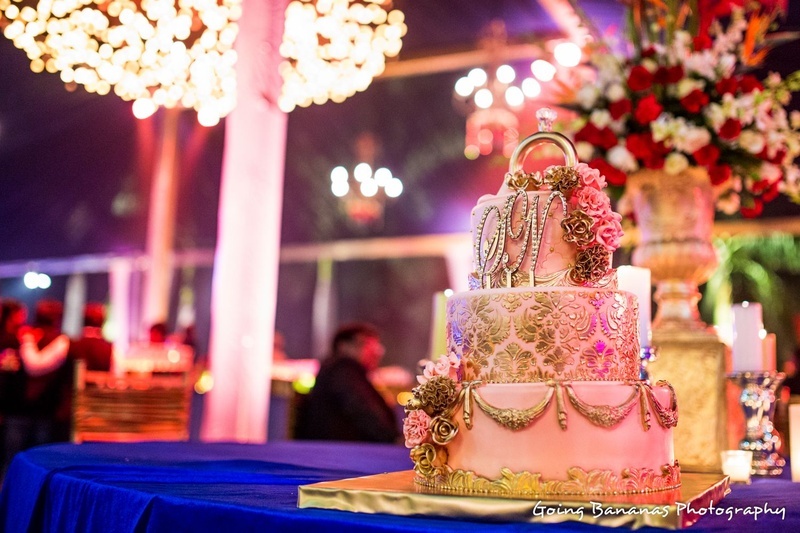 The three-tier, damask-patterned cake decorated with bejeweled initials of the bride and groom was our personal favorite. 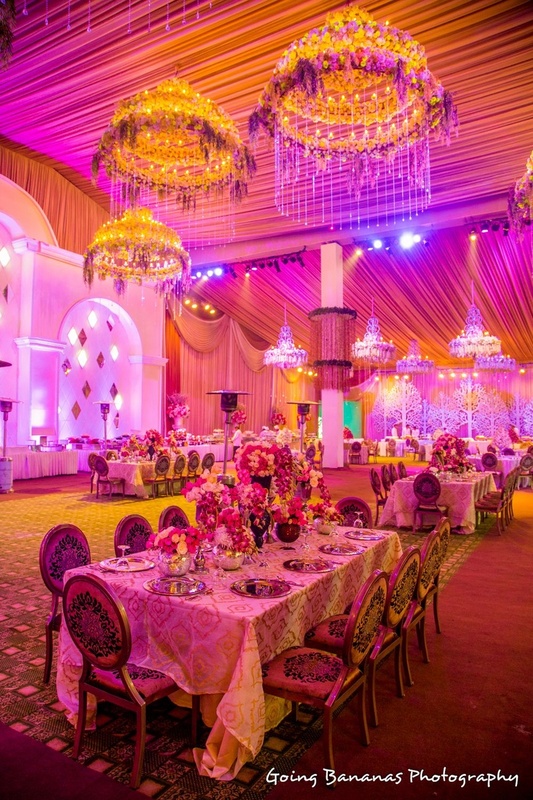 The abundant use of white carnations, pretty pink peonies and purple-hued drapes strung with grand glass chandeliers created a regal atmosphere. 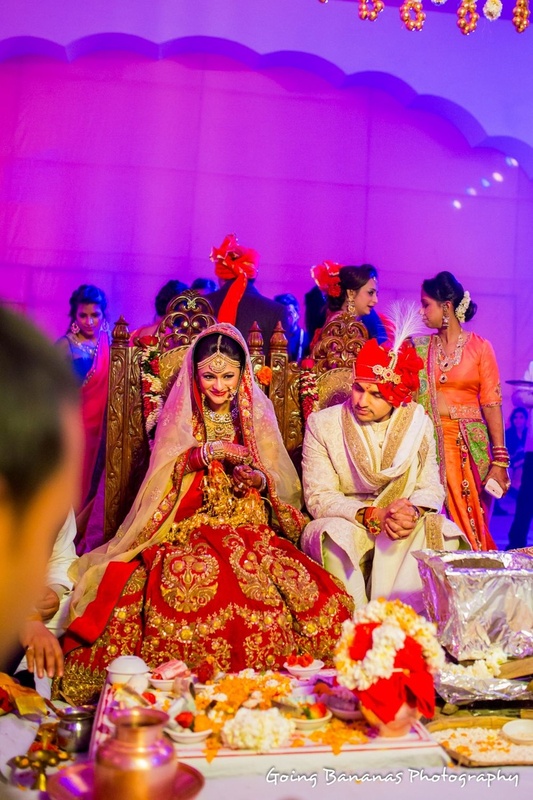 Shweta donned a scarlet red Sabyasachi lehenga, intricately embellished with gold sequins and beads, looking absolutely ravishing. 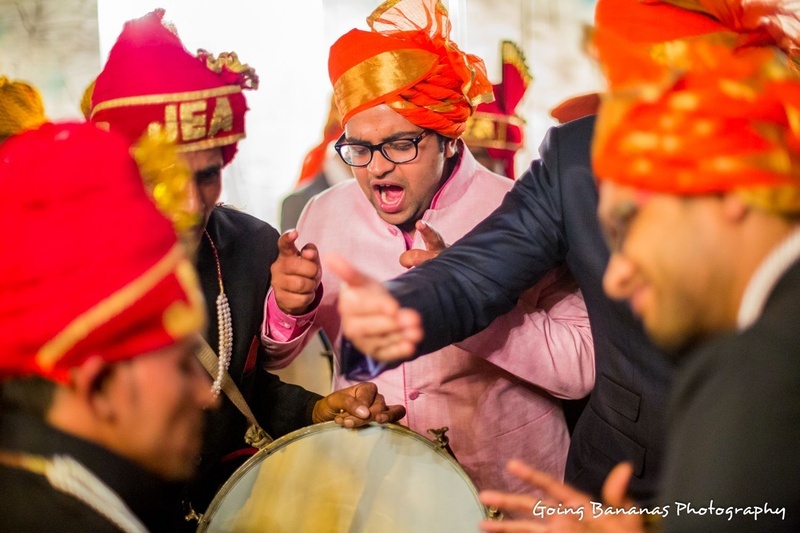 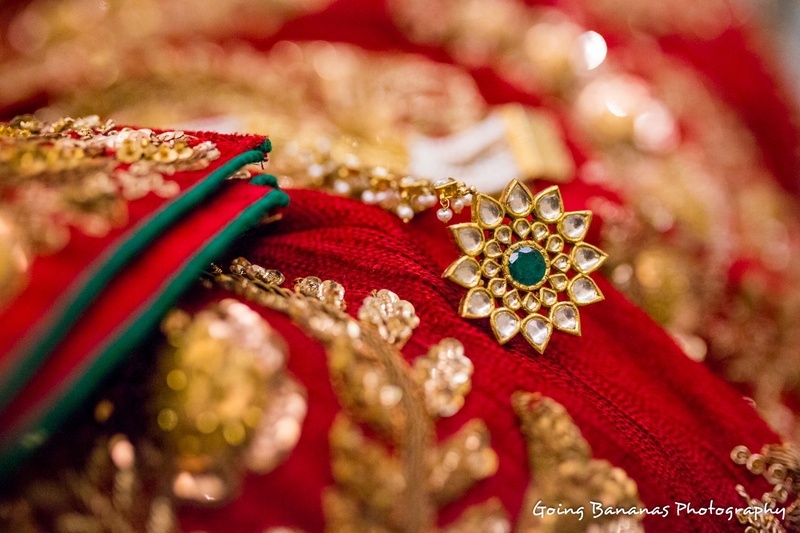 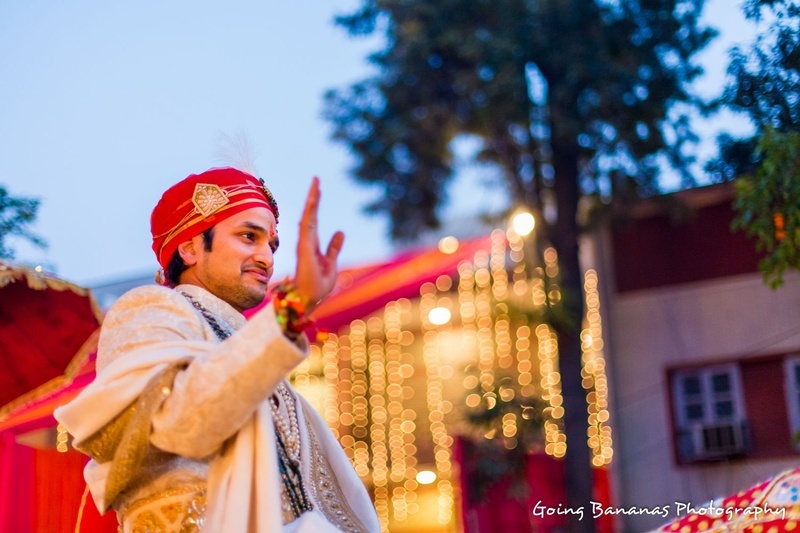 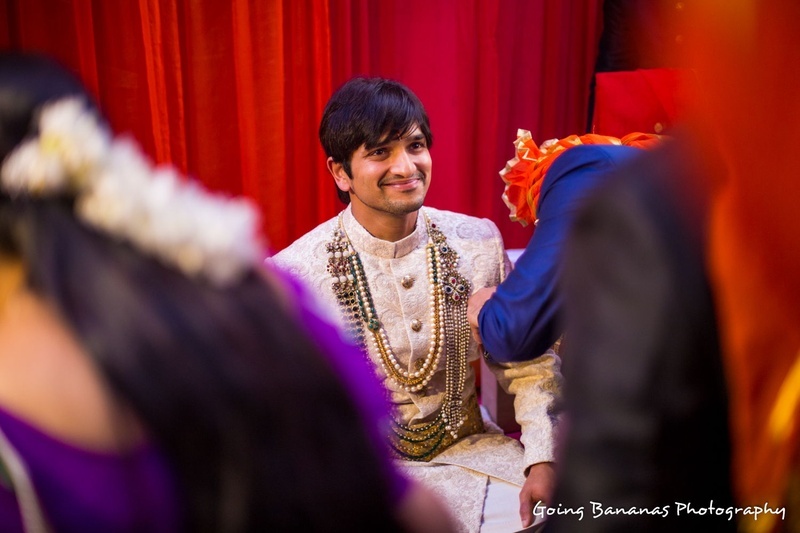 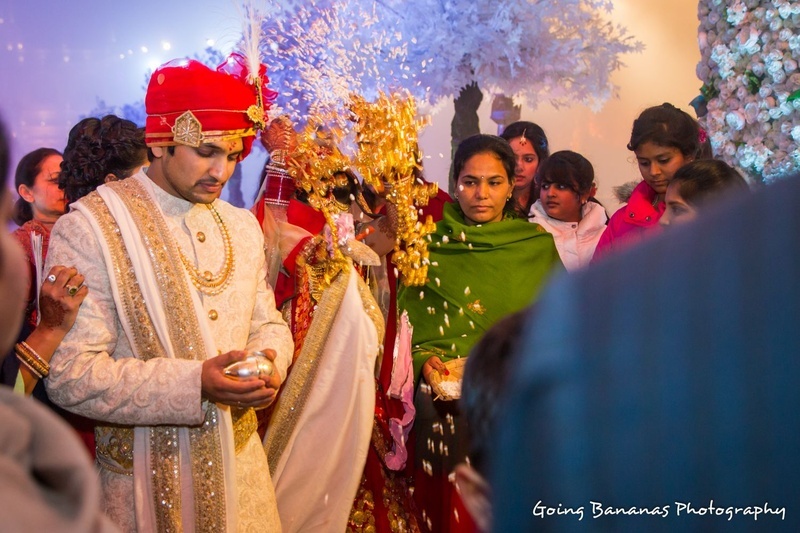 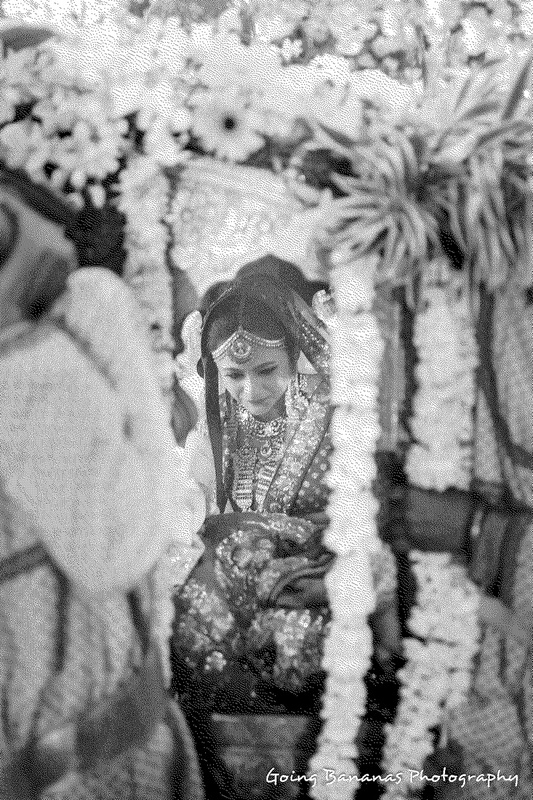 Her handsome groom, Namit, kept up to speed wearing an ivory and gold round-collared sherwani. 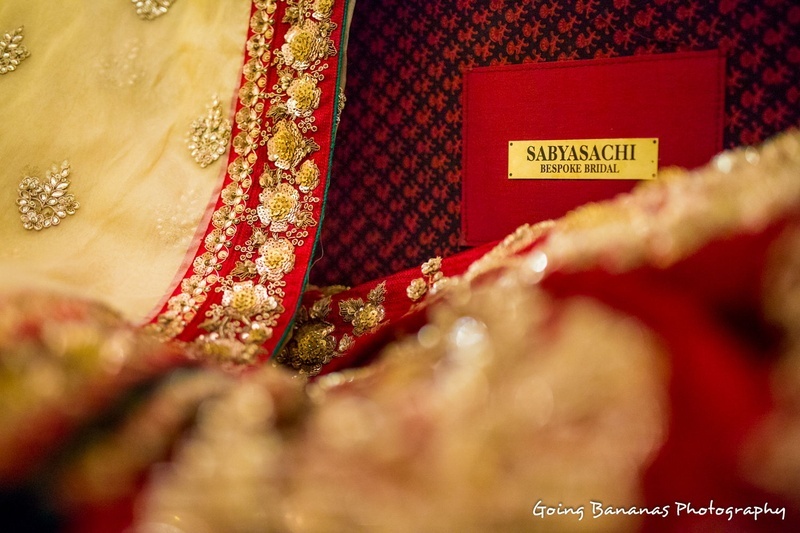 He styled it with a matching white dushala and an embroidered waist-belt. 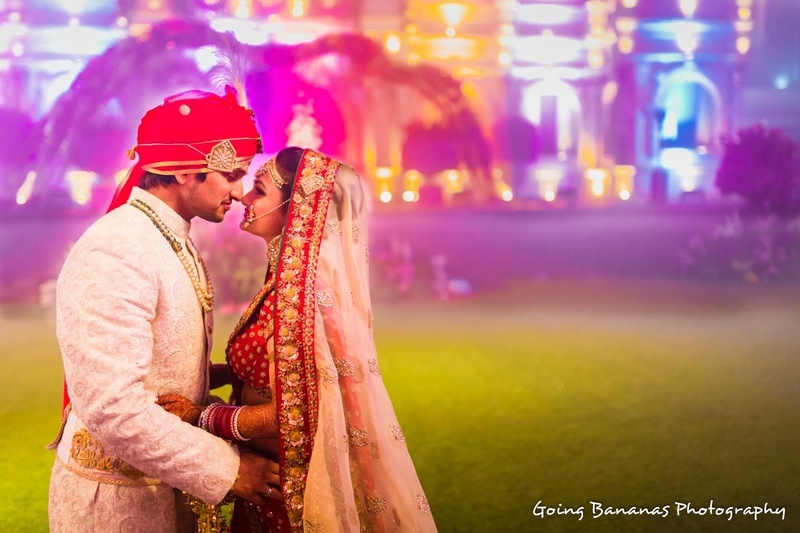 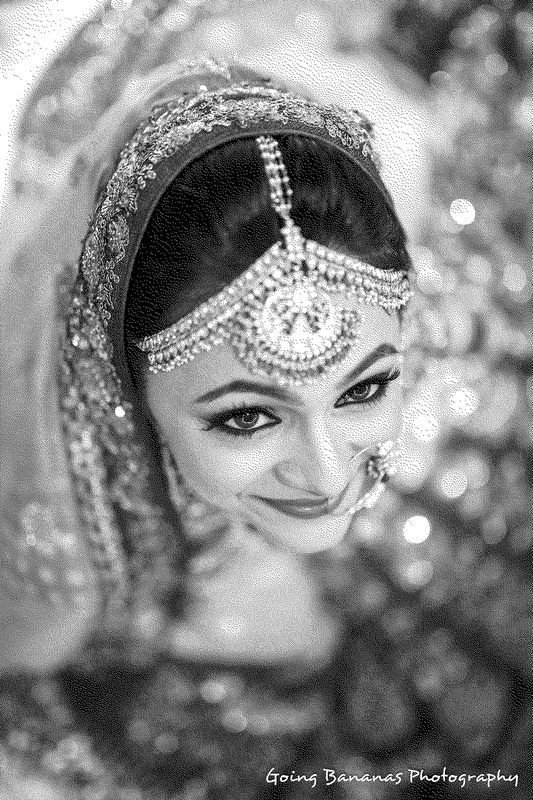 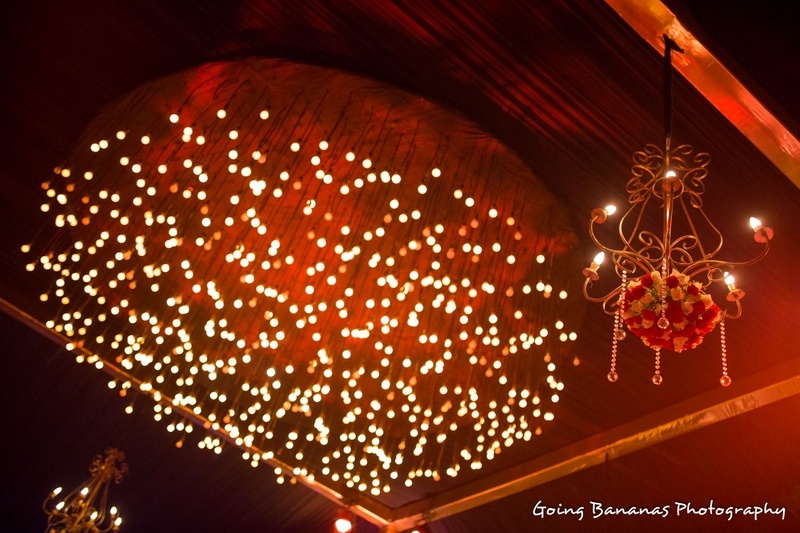 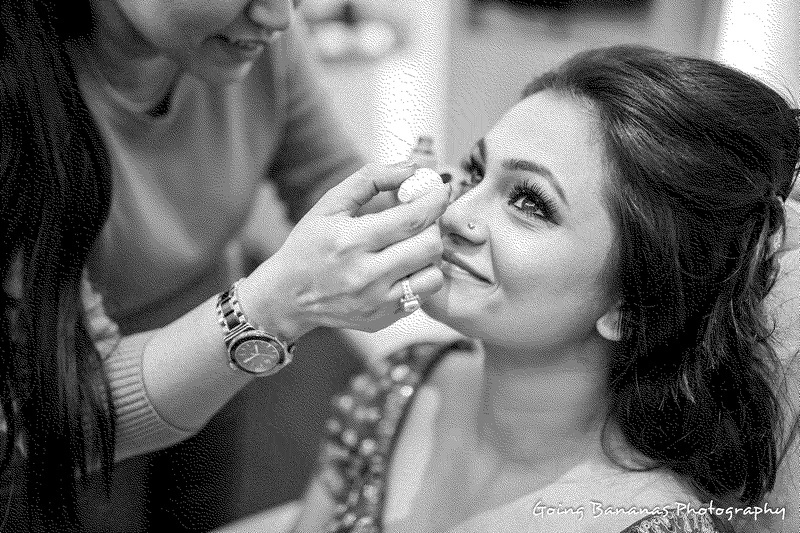 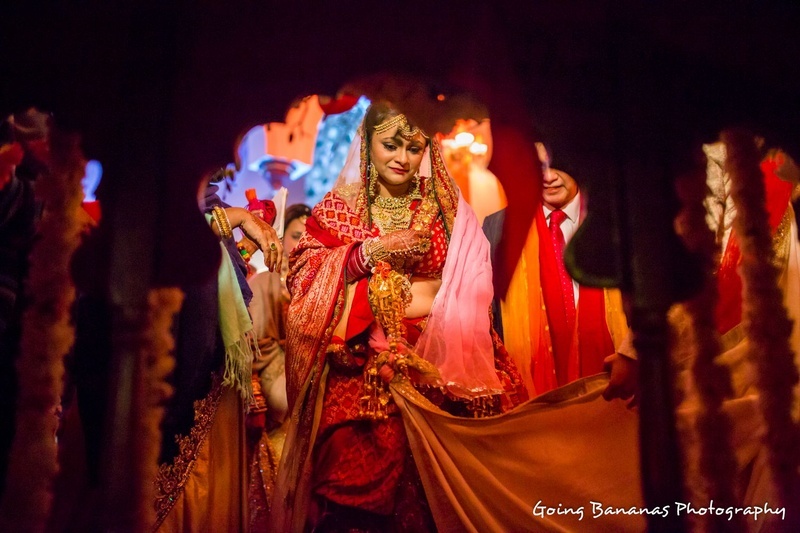 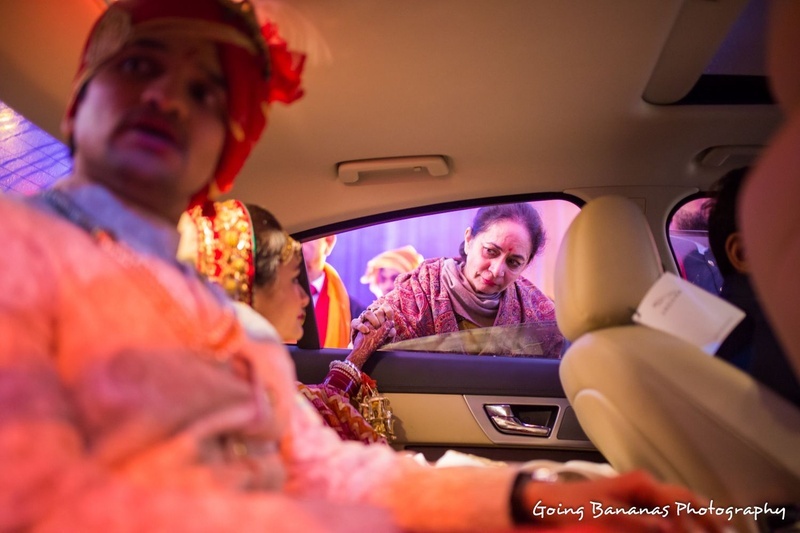 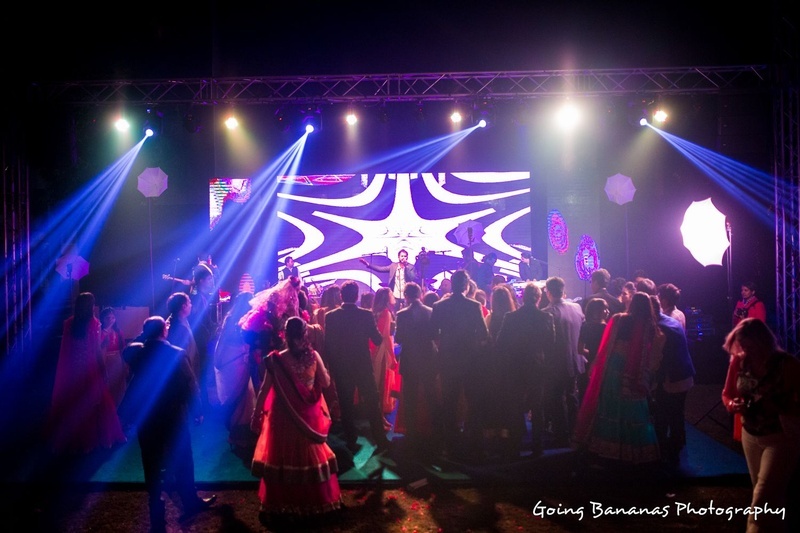 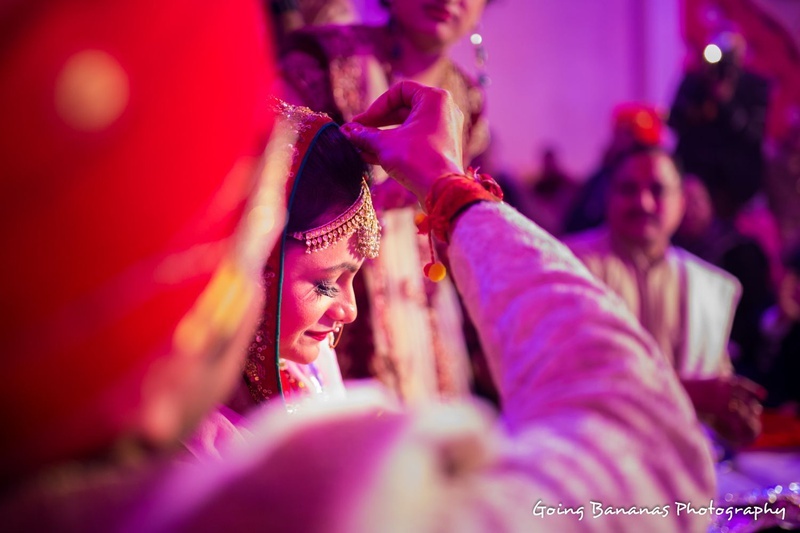 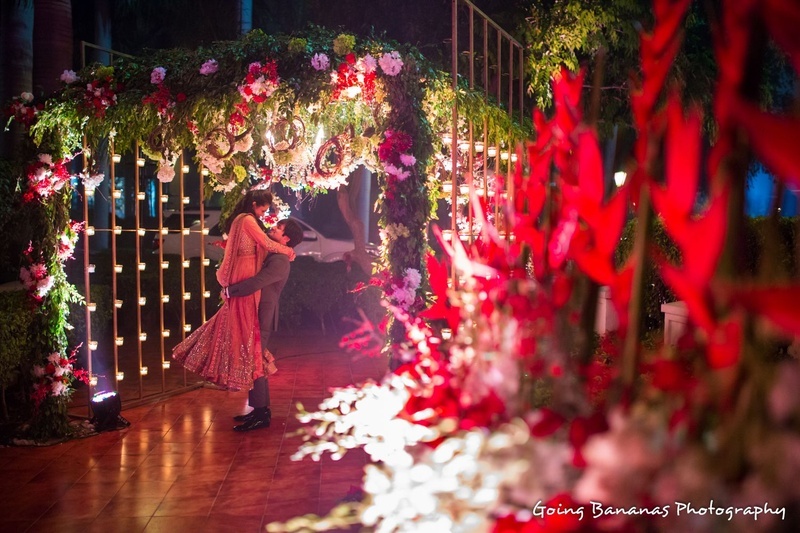 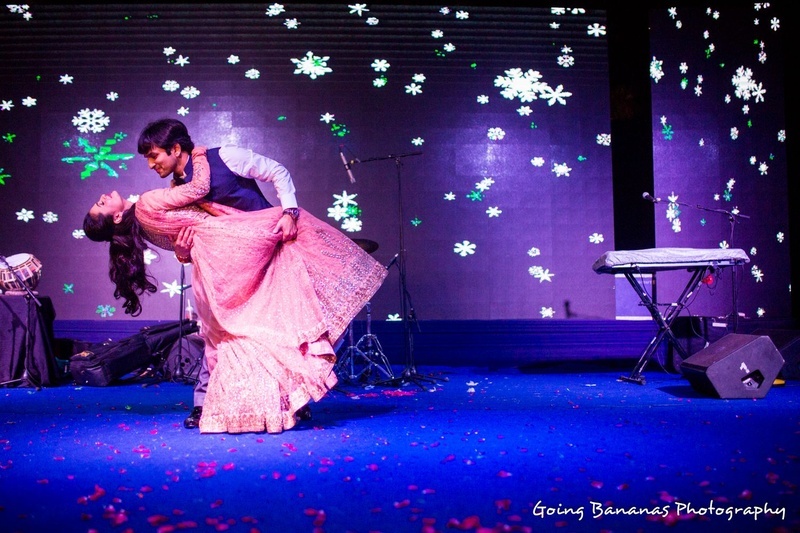 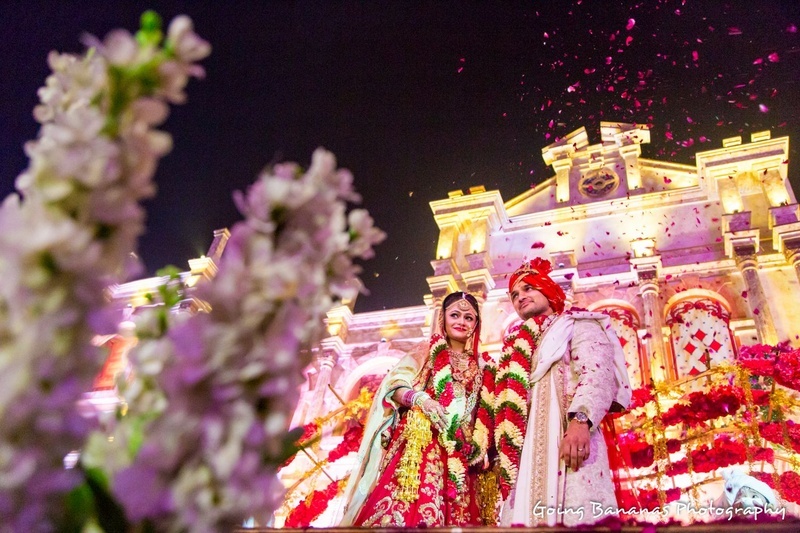 We sure went bananas when we saw shots of Shweta and Namit’s union so perfectly captured by Going Bananas Photography, and we’re positive you will too. 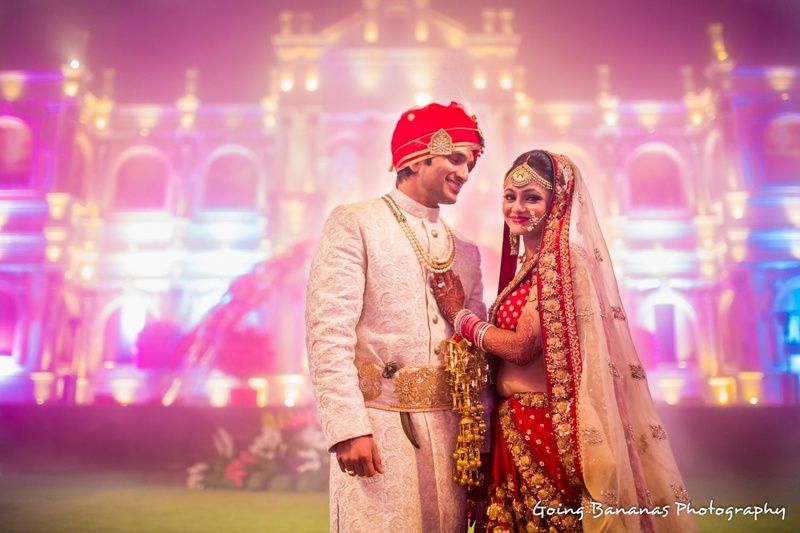 Take a look at this exquisite wedding affair right here!